Look at this great resource! So as you probably know if you are a regular reader, I am a big fan of light tables. Adding light to an activity, brightens everything, including my attention span! This was the first time we tried out this resource, the First Look Light Table Kit so I laid it all out, showed Daisy the contents and let her explore. There are over 300 pieces in this kit and I couldn’t fit them all on the table! 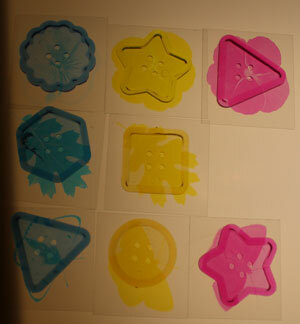 Clear Big Buttons were matched with colourful leaf, flower and butterfly transparencies. 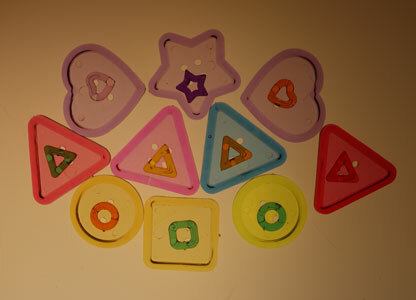 Here Daisy has matched the shapes of the Clear Big Buttons and the Fancy Stringing Rings. I have realised the importance of letting children explore independently, without the restrictions of set tasks or outcomes. Simply playing. The chance to fully explore a resource without the pressure of outcomes, allows children to follow their own thought patterns and investigate their own theories. As teachers we are often too quick to narrow a resource into a set learning activity and then we wonder why students are playing with the resources rather than doing the activity we set! The pressure of following curriculum and meeting teaching targets means we often sacrifice open ended exploration. ECE’s are wonderful at setting up explorations free from set outcomes. “Invitations” are happening frequently in daycare and preschool rooms. This carries into kindergarten where teachers still recognise the need for play based learning. My wish: play based learning with open-ended exploration continues through elementary school. Is this possible while still meeting curriculum targets? My answer is yes, what is yours? I wholeheartedly agree! What an awful lot of fun! Children, especially of this age, learn far more when engaged in spontaneous play. You are making me want a light table, even though my children are teens now. Hey, we need to play too! I have wished for a light table, and will probably construct a DIY one. The resources in this Roylco kit look great. I am definitely a believer in open ended learning activities for all ages! In fact I think the reason the American educational system is troubled is because open ended activities have not been supported universally to encourage individual learning and discovery. I agree. Lack of open-ended activities and a focus on product rather than process does limit our children. Bring on play!